As Lucy Rose prepares to perform at the Liverpool O2 Academy in November, Getintothis’ David Hall has all the details. 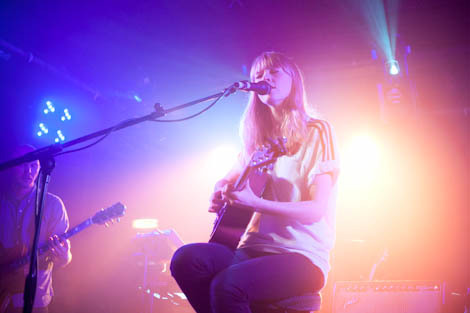 Better known for featuring as a vocalist with other acts than as an artist in her own right, Lucy Rose is a voice many will no doubt have heard. Whether it’s on Manic Street Preachers’ Rewind the Film album (guesting on opener This Sullen Welsh Heart), closing out an episode of Girls, or her significant contribution to the darling charm of Bombay Bicycle Club, Rose’s is a familiar vocal. Hers may not be a familiar name just yet however, and her solo material deserves much more exposure away from the bigger names she has so far been associated with. Yet with her new album Work It Out released over the summer showcasing an evolution in sound compared with her more stark, sketched debut Like I Used To, there are songs both rich and bare to look forward to when her UK tour brings her to Liverpool. Incidentally, Rose’s visually-striking videos are also really beautiful as well, and we thoroughly recommend you take a few minutes to check them out below. She has completed the groundwork to a promising career, proving herself as a highly regarded and sought-after vocalist, if three albums’ worth of Bombay is anything to go by. As we all know, there’s a fine line between getting yourself out there and living in other’s shadows. Well on her way to being a breakout performer in her own right, it might just be Lucy Rose’s time in the sun. Lucy Rose plays the Liverpool O2 Academy 2 on November 7 with support from Flyte and C Duncan.